Chiropractor good or bad?Just got home from my first ever visit to the chiropractor wow it's crazy how many years I've put up with pain I first discovered I had scoliosis in 2008 since then my back has gotten so bad and I have since noticed the pain traveling up into my neck. I had X-rays done today and pictures of my posture, Dave came with me and we got to see the X-rays it's crazy how bad my spine was!! Your meant to have three nice curves in your spine my top part of my spine is straight and the bottom half is pushed to one side and my hips uneven. 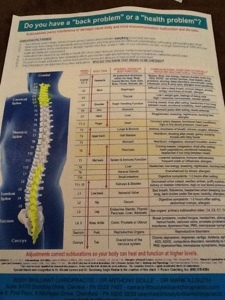 I was given a picture of a spine with underlying problems caused from whichever part of your spine is being obstructed I now know they based this sheet off me I had every little problem according to the obstructions in my top and bottom half of my spine crazy!! My dad is definitely a skeptic of chiropractors I am out to prove him wrong after having put up with this pain for five years I have never been so excited to go back next Monday and find out my results and the process from there! !